I didn’t realize it until I sat down to write this, but clearly I was hungry when I compiled this week’s favorites. It isn’t like I pull these together all at once, but rather I collect them over the course of weeks or sometimes months. But there must have been something about St. Patrick’s Day that made me want to look at food. I hope you’ve eaten lately. You often see shamrocks representing St. Patrick’s Day. There are also plenty of rainbows to go around in March. However, I’m not sure I’ve ever seen the two combined the way they are in these Homemade Rainbow Shamrock Chips from Smart School House. Those little Girl Scouts get my husband every year. He says it’s the Thin Mints, but who can say no to those sweet little girls? I’ll have to hang onto this recipe for Chocolate Covered Mint Patties from Mom on Timeout for when his stash in the freezer runs out. What is it about two little eyes and a smile that makes everything cuter? Check out this Kanzashi Shamrock Pin from Wild Olive. No one would pinch you while you’re wearing it. I’m kind of loving this bark trend. It’s so easy, and you can throw just about anything you like in there. It’s the soup of desserts. 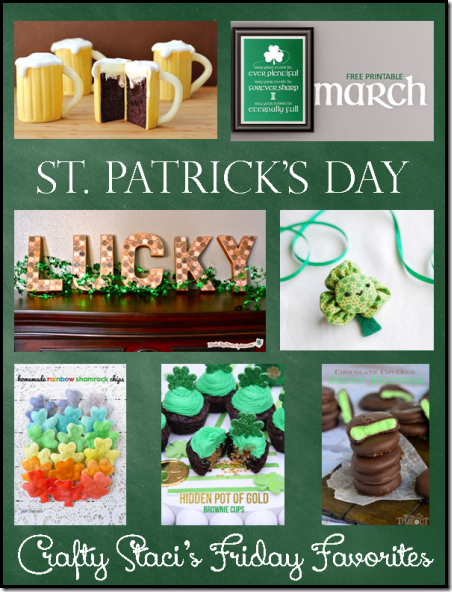 Celebrate St. Paddy’s with this Leprechaun Bark from Paint Chips and Frosting. What’s a more appropriate St. Patrick’s Day decoration than a bunch of lucky pennies? The beauty of these Lucky Penny Letters from Made by Marzipan is that they could be left out all year! This Rainbow Seeds Printable from A Few Short Cuts would be fun for kids to share. Is it still a rainbow if I only want the red and purple Skittles? And a few orange ones? I love the surprise inside these Hidden Pot of Gold Brownie Cups from Pizzazzerie. These printable St. Patrick’s Day Soda and Beer Labels from Today’s Creative Blog are a fun and easy way to add a little green to your day. In general, I’m not much of a beer drinker. Baileys Irish Cream, on the other hand, is one of my favorites. That said, I think it would be interesting to try these Beer Mug Cupcakes with Baileys Filling from Tablespoon, but substitute the water called for in the recipe with beer. This Irish Sewing Blessing Printable from The Inspired Wren is made up, but I love it anyway and need it for my sewing room.